Most of the grassland in Denmark has been destroyed through cultivation, fetilization and tree-planting. In modern farming the cattle are often kept indoors for milk-production and grassland are no longer needed for grazing and hay-gathering. If grazing of the grassland stops or ceases, tall growing herbs and grasses take over and the smaller weak-growing plant species will die out. The remaining grassland often lies on ground which is difficult to cultivate and many are today protected as nature reserves. 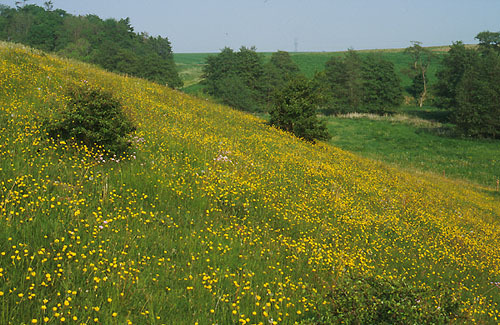 Some of the grassland has been in use for centuries, and the flora is very rich. In the early spring the first plants are flowering. It is mostly annuals as Erophila verna, Arabidopsis thaliana, Myosotis-species and Veronica-species. In May it is Ranunculus bulbosus (right picture) and Saxifrage granulata, which turns the grassland in to yellow and white. Through the summer a lot of plants can be seen as Hypochoeris radiata, Stellaria graminea, Hieracium pilosella, Knautia arvensis, Rumex acetosa, Achillea millefolium, Centaurea jacea, Polygala vulgaris, Thymus pulegioides, Succisa pratensis amd grasses as Festuca rubra, Poa pratensis, Anthoxanthum odoratum, Cynosurus cristatus, Poa trivialis, Agrostis tenuis and Holcus lanatus. On grassland on calcerous clay some lime-loving species can be found as Filipendula vulgaris, Briza media, Linum catharticum, Leontodon hispidus, and Cirsium acaule. Many of the plants species growing on grassland are adapted to grazing e.g. 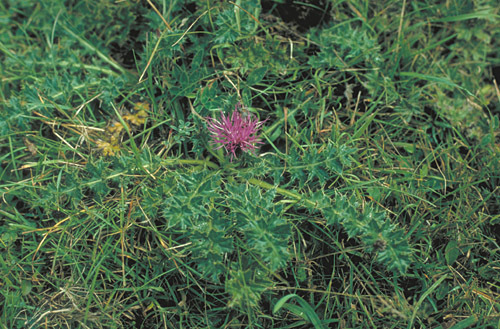 Cirsium acaule (picture left) as it is very stinging and the flowers are developed near the surface of the ground. Other typical species occasionally seen between the common are Carex caryophyllea, Helictotrichon pratense, Helictotrichon pubescens, Danthonia decumbens, Hieracium lactucella, Primula veris and occasionally Orchis mascula. Back to the river valleys in Eastern Jutland.